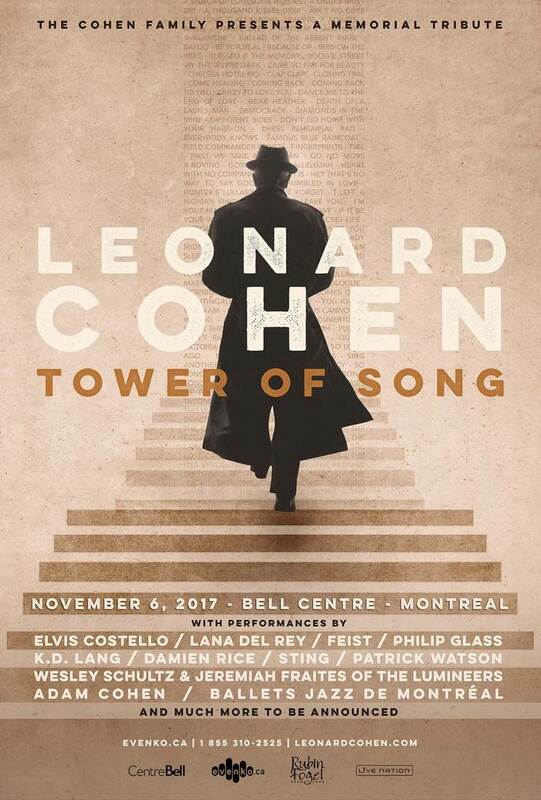 Montreal will pay homage to late hometown hero Leonard Cohen later this year with a special tribute concert dubbed "Tower of Song: A Memorial Tribute to Leonard Cohen." The concert will commemorate the first anniversary of the legendary singer-songwriter's death, taking place on November 6 at the Bell Centre in Montreal. Elvis Costello, Lana Del Rey, Feist, Philip Glass, k.d. lang, the Lumineers' Wesley Schultz and Jeremiah Fraites, Damien Rice, Sting and Patrick Watson have all been confirmed as performers. Cohen's son, Adam Cohen, will also perform, as well as co-producing the event with Hal Willner. "My father left me with a list of instructions before he passed: 'Put me in a pine box next to my mother and father. Have a small memorial for close friends and family in Los Angeles…and if you want a public event do it in Montreal," the young Cohen said in a statement. "I see this concert as a fulfillment of my duties to my father that we gather in Montreal to ring the bells that still can ring." Proceeds from the event will go towards a number of Canadian arts organizations, including Canada Council for the Arts, the Council of Arts and Letters of Quebec, and the Montreal Arts Council. Tickets for the concert go on sale September 23 at noon local time. They range in price from $40.25 to $276.50 and will be available through the Bell Centre box office or online. "Tower of Song" isn't the only Cohen tribute coming to Montreal this fall, though. As previously reported, a new exhibition called Leonard Cohen: Une brèche en toute chose / A Crack in Everything opens at the Musée d'art contemporain de Montréal on November 9. Earlier this year, a massive new mural project honouring the late Canadian singer was also unveiled in Montreal. Pick up a copy of The Songs of Leonard Cohen via Umusic. k.d. lang Announces Sprawling "Ingénue Redux Canadian Tour"